https://sep.yimg.com/ay/yhst-33477391359232/brown-saddle-clown-fish-amphiprion-polymnus-saddleback-clownfish-7.jpgBrown Saddle Clown Fish - Amphiprion polymnus - Saddleback Clownfish ModerateSemi-aggressive30 Gallon5.1 inchesYesOmnivore, BrineIndian Ocean and Western PacificPomacentridaeSmall 3/4" - 1 1/4"
The Brown Saddle Clownfish, sometimes referred to as the SaddleBack Clownfish, is orange-brown with a large white stripe from the forehead to the chest, and white patches on the back, saddle, and tips of the tail. This species is endemic to the Indian Ocean and Pacific ocean. The Brown Saddle Clown Fish are found in nature associated with Stichodactyla sp., Heteractis sp., Macrodactyla sp. and Entacmaea sp. anemones. Of the mentioned species, the Entacmaea sp. or Bulb Anemone has proven to be the least demanding and most hardy. The Brown Saddle Clownfish are very hardy and durable fish making them a perfect addition for the novice or seasoned aquarist. The Saddleback Clownfish is a good candidate for a reef aquarium. If introduced to the aquarium at the same time, many varieties of tank-bred clowns can be maintained together in the aquarium. 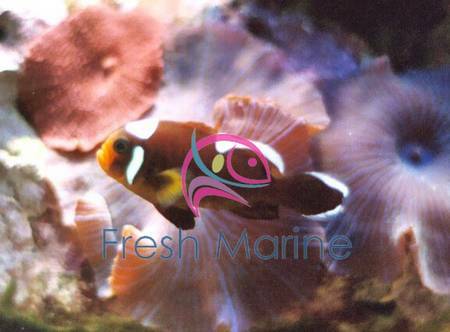 General Size Specifications: The Brown Saddle Clownfish generally grows upto 5 inches. The small size come to you generally � to 1� inches; the medium generally 1� to 2� inches; the large generally 2� to 4 inches. Habitat: A 30 gallon or larger aquarium is desirable. It may be kept in small groups and will be happier if a host anemone is present such as Haddon's Sea Anemone Stichodactyla haddoni. It becomes more aggressive towards conspecifics as it ages. Minimum Tank Size: The tank size for the Brown Saddle Clown is not to be less than 30 gallon with plenty of place to hide and swim. As an aquarium species it requires medium level of care i.e. it is not difficult for them to sustain in aquatic conditions. Feeding and Diet: The Saddleback Clownfish diet consists of meaty food items, chopped table shrimp, and herbivore preparations. Breeding: The Saddleback Clownfish are easy to breed in the home aquarium. The females will be the largest of the pair, and two fish will usually stay close to each other in the aquarium. The Brown Saddle Clownfish are egg layers and will deposit the eggs on a flat surface, and defend the eggs from other tank mates. The eggs will normally hatch in 6-11 days depending on the temperature. The fry must be reared in a separate aquarium on a diet of rotifers then baby brine shrimp. The development of the Brown Saddle Clownfish from juvenile to adult is dependent on the system of hierarchy. There is aggression involved in these small families although usually not between the male and the females. The aggression usually is between the males. The largest male will bully the next smallest male and the cycle continues until the smallest fish leaves the host anemone. An aggressive eater, the Saddleback Clownfish will consume most meaty foods and herbivore preparations. The Brown Saddle Clownfish may act aggressively toward other fishes.